Afshar is a handwoven rug style produced by the Turkic Afshar tribe, a semi-nomadic group principally located in the mountainous areas surrounding the modern region of Iranian Azerbaijan. An additional population of Afshar tribes-people is located in the Kuchan area in Razavi Khorasan Province of Iran and city of Kerman. Carpets in the Afshar style are known for their striking and stylized floral geometric designs, sophisticated tribal artistry and a characteristic palette of rust and blue color tones. Antique Afshar rugs from the 19th century are characterized by their unusually and consistently high quality of craftsmanship and wool. Colors are virtually always heavily saturated: deep indigo, carnelian, saffron and ochre tones predominate, giving a robust, vigorous character to their designs. 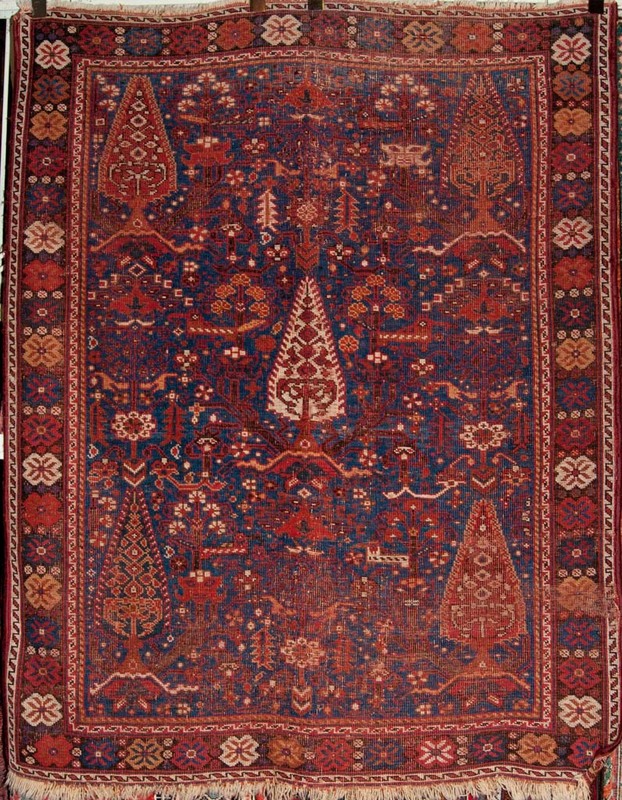 While complex repeating all-over designs are prevalent, Afshar weavers also drew upon Southern Persian carpet imagery, with boteh motifs, shrub and occasionally “Tree of Life” compositions also encountered. Kurdish influences are evident in angular medallion format rugs, as well as in the general spontaneity encountered in several original flower and bird designs. Afshar rugs are virtually always found in the area size format, ranging in size from 3 ft x 4 ft to 4-5 ft x 7 ft. Larger room size pieces are extremely seldom encountered. Longer corridor carpets (5 ft x 10 ft) are occasionally found, as are the small mats and bag faces consistent with their nomadic tribal heritage. Since the Safavid period, the Afshar tribal group has been among the most preeminent Turkic tribal groups, migrating from their origins in Central Asia to settle in Iranian Azerbaijan, Azerbaijan republic, and Eastern Turkey. This background has led to the inclusion of numerous regional influences on Afshar weaving, resulting in a distinctive aesthetic that incorporates elements of several village and nomadic Persian rug styles, as well as Southern Persian design influences. Caucasian rug influences are also strongly felt, seen most notably in the direct parallels to Shirvan carpets woven in the village of Chajli.